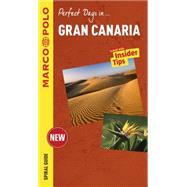 The Gran Canaria Marco Polo Spiral Guide is a compact travel guide for people who have little time to prepare for a trip, don't want to miss anything, like to be inspired by great ideas for exciting days out and love all things ultra-practical and easy to use. Visit the weekly markets (aka the best places to shop in Spain), sample the local tapas, or try some wine at a bodega. Gran Canaria awaits! Top 10 sights: From the top down to make it easy to prioritize! That Gran Canaria Feeling gives tips to help you experience the essence of the island. Get under Gran Canaria's skin and see what makes it tick. Chapters: Las Palmas, The North, Central Mountains, The South. Organized by district; each chapter explores the most important and interesting sights. Restaurant recommendations, the best shopping streets and the hottest places to go for a night out are listed at the end of each chapter. Perfectly planned itineraries for each area including the best places to eat and drink along the way, each with its own map, make exploring easy and stress-free for Perfect Days in Gran Canaria! Coverage of Museo Canario, Catedral de Santa Ana, Casa de Coló, Cenobio deValerón, Caldera de Bandama, Jardín Canario, Teror, Roque Bentayga, RoqueNublo, Artenara, Barranco de Guayadeque, Playa del Inglés and more.